To manage our hiking pace and avoid hiking related problems, we bring attention to bear at three different times: before hiking, during hiking and after a hiking problem has developed. These three timeframes are the basis for Hiking Speed Management…in this essay, we’ll focus on the planning done prior to starting the high peaks adventure. In planning ahead for a high peaks adventure, there are three key decisions to make and plan for: (1) whether the weather is good enough to go at all, (2) what hiking pace strategy should be employed, i.e., “speed” vs. “efficiency”, and (3) what hiking speed to assume in planning for the adventure, e.g., start time, turnaround time. On days where the temperatures are too extreme or the conditions will be slippery, we might consider rescheduling the adventure. The impact on speed and the added risk of injury due to poor conditions has not been considered in this discussion. To “yield and overcome” means to take what the mountain will give; we should not try to impose our will onto the mountain. Selecting a hiking pace strategy is a key part of building “The Plan.” The selection of an estimated hiking pace is based on our hiking strategy for a particular adventure and our own personal hiking variables, such as body structure, fitness & nutrition state. We need to plan for a hiking speed so that we can generate a reliable estimate of hiking time. The hiking time estimate is the basis for our planned Start TOD (time of day) and Turnaround TOD, so we need a reliable estimate. The process starts with the selection of a hiking strategy. The distance needed to travel is predetermined by the selection of a particular hiking path and destination. The longer the hike, the more important efficiency becomes. Abundant resources and / or shortages of time mitigate the need to be efficient. The availability of resources refers primarily to the availability of water & food. As hiking distances become longer, efficient use of resources become more important. Abundant resources mitigate the need for efficiency and allow us to focus more on speed. Hotter, more humid conditions require slower energy output to conserve energy and water. Shortages of time lead us to emphasize speed over efficiency. In addition, hiking pace “strategy” only applies to flat to moderate terrain that is less than 1,500 feet of elevation gain per mile (approx. 15 degrees of slope). On steep terrain, we just try to keep our hiking pace at a best possible, sustainable speed where we must slow down to overcome the much higher required energy output in a low oxygen environment. We’ll call it a part of the “efficient” pace strategy just for simplicity. On flatter terrain, we try to avoid going too fast or too slow; but on steep terrain, we just try to avoid going slower than necessary. 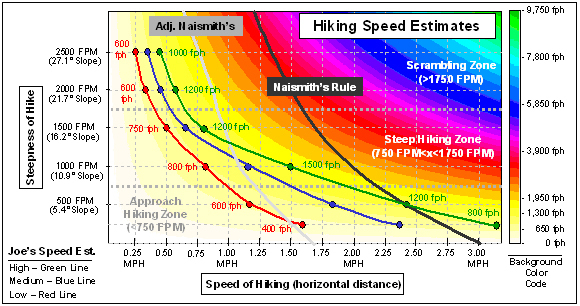 Once we have selected a hiking strategy, we then need to estimate our hiking speed. High speed on the trail is a great thing to brag about; but it is more important to be able to estimate accurately or, at worst, conservatively so we can start early enough to finish before the turnaround time and turnaround in time to get safe before the storms come. Each of us has unique body size, mechanics, strength, fitness, and ability to endure; these factors mean we will each have our own hiking speed for a given set of conditions. When we overlay hiking speed strategy onto ability and conditions, there is no longer any way to compare any two hikers on the trail. But all that matters is being able to accurately predict a hiking speed so that we can precisely plan a start and turnaround time. Estimating speed is part strategy and part unique hiking style/skill/fitness that we each bring to our mountain adventures. There are two valid ways to proceed here: (I) use a generic, one-size fits all time estimator or (II) use a personal history based on our own hiking speeds over a variety of distances, terrains and conditions. The latter is better, but let’s review both. William.W. Naismith was a founder of the Scottish Mountaineering Club. In 1892, he devised a rule of thumb to aid in estimating the length of time it would take to walk a predefined walking route including ascents and descents. His simple rule is: allow 1 hour for every 3 miles forward, plus ½ hour for every 1000 feet of ascent. when hiking on poor terrain, use 2.5 mph instead of 3 mph. on a gentle decline (5-12°), subtract 10 minutes per 1000 feet of descent. on a steep decline (over 12°), add 10 minutes per 1000 feet of descent. Apparently, Mr. Naismith was a very fast hiker and hiked with other very fast hikers. Even the adjusted rates of hiking are too fast for most people in terrain over 1,200 feet per mile. Perhaps we should only use these as a starting point, but be conservative. In the years since Naismith, “Tranter’s corrections” have become commonly available for making fine-tuning adjustments to the Naismith’s Rule for fitness and fatigue. Fitness is determined by the time it takes to climb 1000 feet over a distance of ½ mile (our fastest speed for a mere ½ mile, not for a 10-20 mile day). Adjustments for pack weight, poor terrain or conditions or other fatigue causing variables can be incorporated by dropping down one or more fitness levels. Use the chart below by first determining a time estimate using Naismith’s Rule (find time rounded to nearest hour in upper row), then select the appropriate row beneath to find the adjusted time estimate. Once again, these should be used conservatively until more precise estimates can be developed based on personal history. Nothing is better than a personal history for predicting a hiking pace. Each of us should keep track of our own history to develop a solid idea of our own hiking speeds. Ideally, we would keep track of every variable, such as external temperature, trail conditions, distance, steepness, hiking speed strategy. But that can be a bit overwhelming. Using personal trip reports, I have kept track of my hiking speeds using only distance, steepness and speed. Using this information, I was able to isolate fast & slow range boundaries to account for heavier/lighter loads, good/bad days, firm/loose trail conditions, and personal fitness in aggregate. I haven’t tried to do a scientific study of my speed and the causes thereof, but rather just tried to get an assessment of how fast I seem to hike over time. By separating the upper and lower limits of my speeds, I am able to apply my hiking strategies quite easily. Plotted lines represent horizontal mileage & elevation gain (high, med. & low speed) for slope angles from approximately 3ْ to 27ْ. MPH is miles of horizontal distance traveled per hour; actual hiking distance is somewhat greater than horizontal distance due to the elevation gain. Mileage & horizontal speed estimates for very steep angles are hard to use due to switchbacks; instead use “feet of elevation gained per hour” (FPH). Terrain that is 1000 feet of elevation gain per mile (approx. 10 degrees) is the most efficient for my body to gain distance and elevation (see FPH). The key is to seek out 10-degree slopes and use switchbacks to lessen the angle of steeper terrain. Use “low” estimates for “Efficiency” applications involving heavy packs. See Working the Trail for a discussion of our efforts to manage our hiking pace during the hiking and dealing with hiking problem if they should arise.